The Earth's oceans could one day provide enough energy to power homes and businesses. Technologies have been developed to harness energy from tides, waves, temperature gradients , ocean currents, ocean winds, and salinity gradients. The three most developed technologies derive energy from tides, waves, and Ocean Thermal Energy Conversion (OTEC) and are described below. Tidal power is not a new concept, and has been used since the eleventh century in Great Britain and France to turn water wheels. Presently, power is generated from tides in a manner similar to hydroelectric power plants. A barrage (dam) is built across an estuary . Gates and turbines installed at regular intervals along the barrage are opened when there is significant difference in water elevation on either side of the barrage. Water flows through the turbines and electricity is produced. This method can be used for water flowing both into and out of the estuary. Two commercial-scale barrages currently are in operation: Barrage De La Rance, near St. Malo, France; and Annapolis Royal, Nova Scotia, Canada. Several other tidal power stations are being considered, including the Severn project in Great Britain. 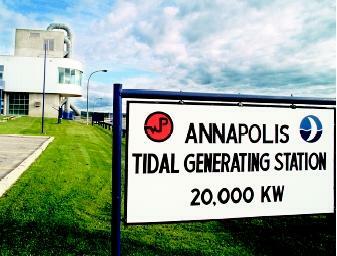 The Annapolis Tidal Generating Station in Nova Scotia, Canada is capable of generating 30 million kilowatt-hours annually—enough to power 4,000 homes—by using tidal energy in the Bay of Fundy. It is one of only two commercial producers of electricity from tidal power; the second one is located in France. in an estuary will change the tidal level in the basin. This change will have a marked effect on the turbidity (cloudiness) of the water and sedimentation within the basin, which in turn affects navigation and recreation. An altered tidal level will also have an effect on the local marine food chain . However, because very few tidal barrages have been built, little is understood about the full impact of tidal power systems on the local environment and it is evident that its effects greatly depend on the local geography and marine ecosystem. Wave energy generation devices fall into two general classifications: fixed and floating. Fixed generating devices, which are mounted either to the seabed or shore, have some significant advantages over floating systems, particularly in the area of maintenance. However, the number of suitable sites available for fixed devices is limited. The Oscillating Water Column, a fixed device built on shore, generates electricity in a two-step process. As a wave enters and leaves the column, the water in the column rises and falls, which in turn forces air back and forth through a turbine at the top of the column. This is a very simple device, but it is difficult to build and anchor so that it is able to withstand the roughest sea conditions and yet generate a reasonable amount of power from small waves. Much research is occurring internationally to develop oscillating water columns that require less stringent siting conditions, including the OSPREY, and floating columns, such as the Japanese Mighty Whale. Ocean waters are a source of usable energy by virtue of their physical and chemical characteristics. The energy of waves, tides, currents, and temperature and salinity gradients can be harnessed by existing technologies, and could some day be a more widespread source of power. over the walls of the channel and into a reservoir, which is positioned several meters above mean sea level. The stored water in the reservoir is then fed through a turbine and generates electricity much like a hydroelectric dam. TAPCHANs have low maintenance costs and a greater reliability than the Oscillating Water Column; however, TAPCHAN systems are not suitable for all coastal regions in that there must be consistent waves with good average wave energy and a tidal range of less than 1 meter (3.28 feet). Floating-wave energy devices generate electricity through the harmonic motion of the floating part of the device, and are extremely efficient. 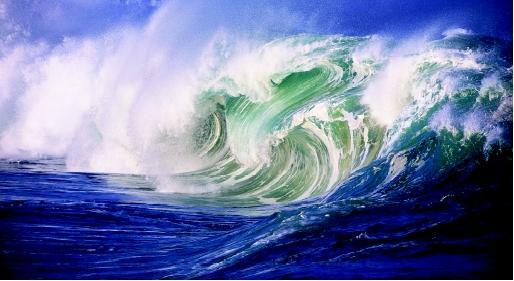 In these systems, electricity is generated through the rise and fall of the waves. Examples of fixed devices include the Salter Duck, Clam, and Archimedes wave swing. Ocean Thermal Energy Conversion (OTEC) utilizes the temperature difference between the warm surface sea water and cold deep ocean water to generate electricity. As long as a sufficient temperature difference (20°C or 68°F) exists between the warm upper layer of water and the cold deep water, net power can be generated. There are three types of OTEC processes: closed-cycle, open-cycle, and hybrid-cycle. In the closed-cycle system, heat transferred from the warm surface sea water causes a "working fluid" (such as ammonia, which boils at a temperature of about 25°C, or 78°F, at atmospheric pressure) to turn to vapor. The expanding vapor drives a turbine attached to a generator that produces electricity. The working fluid passes through a condenser and turns back into a liquid that is then recycled through the system. Open-cycle OTEC uses the warm surface water itself as the working fluid. The water vaporizes in a near vacuum at surface water temperatures. The expanding water vapor drives a turbine attached to a generator and produces electricity. The water vapor, which has lost its salt and is almost pure fresh water, is condensed back into a liquid by exposure to cold temperatures from deep-ocean water. If the condenser keeps the vapor from direct contact with sea water, the condensed water can be used for drinking water, irrigation or aquaculture. A direct contact condenser produces more electricity, but the vapor is mixed with cold sea water and the discharge water is salty and is returned to the ocean. The process is repeated with a continuous supply of warm surface sea water. Hybrid systems use parts of both open-cycle and closed-cycle systems to optimize production of electricity and fresh water. Aside from the generation of electricity, it has been proposed that OTEC plants assist ocean-based industries, such as aquaculture , refrigeration and air conditioning, desalinated water crop irrigation and consumption, as well as mineral extraction through the use of the fresh and chilled water byproducts. SEE ALSO Geothermal Energy ; Hydroelectric Power ; Ocean Currents ; Tides ; Waves . Cassedy, Edward S. Prospects for Sustainable Energy: A Critical Assessment. New York:Cambridge University Press, 2000. Ross, David A., Introduction to Oceanography, 5th ed. New York: HarperCollins, 1995. 1. Wave Air Pump - WAP: Compresses air and feed it into the air inlet of a turbine, add fuel as needed to maintain turbine output irrespective of wave heights. 2. Wave Water Pump - WWP: Lifts a small quantity of water to a high head and feed it to a hydro-turbine to produce power, or compressed air to feed another turbine and act as a WAP. A set of pumps up to ten may be installed in line with the incoming waves and a mile wide to extract most of its energy. The proposed systems can generate electric power at a cost less than 2 Cents per kilowatt-hour. 1. Simple construction, low capital and maintenance costs, efficient energy extraction, auto-adjust to varying wave heights and sea levels, and provide dependable power output. 2. Resist storms, and are safe to navigation. 3. Zero emissions; do not disturb marine life or shoreline scenic view, and provide a Free Floating Break Water Structure.